I’m not really sure what to write on days like this — I’m at a loss for words. The best I can do is remind you once again to keep your head up wherever you go and if you see something, say something while riding Metro and contact Metro Security at 888.950.7233. The Gold Line’s Del Mar Station now occupies that location. The Super Chief once upon a time ran at street level through Old Pasadena — thus the wide alleyway above the now-underground Gold Line. I’m not crazy about trails that have drop-offs into the abyss, thus the reason I avoided the Devil’s Backbone Trail all these years. I finally decided to do it and hoofed it up to the summit of Mt. Baldy, the highest point in L.A. County at 10,064 feet. Fun and mostly not scary except for one short-ish section of trail (not the one above) that I found to be Extremely Attention Grabbing. And, yeah, I unapologetically used the ski lift to reach the Notch. And just to plant a seed: I hope there’s a Mt. 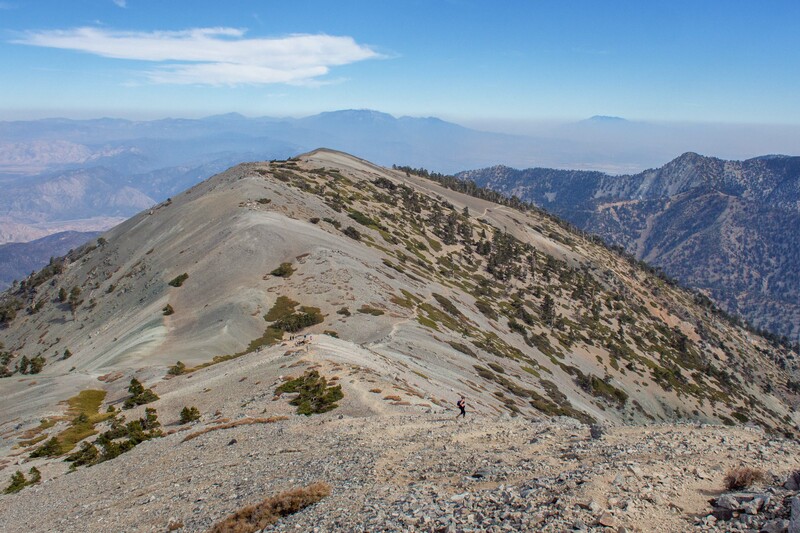 Baldy weekend hiking/skiing shuttle from the Gold Line’s Claremont Station when the extension opens in 2027! Photo courtesy Steve Hymon. This involves the project to build light rail or bus rapid transit along Van Nuys Boulevard and San Fernando Road between the Van Nuys Orange Line Station and the Sylmar/San Fernando Metrolink Station. Some business owners are concerned by one of the rail alternatives that would displace businesses for a potential rail yard. The story involves one potential site — west of Van Nuys Boulevard and just south of the Orange Line — and there are other potential locations. Metro has extended the public comment period through Oct. 30 and added an additional community meeting on the evening of Oct. 10 in Van Nuys. Details in this post. The first link is to a wonderful, originally photo essay of some of the thousands of homeless people in our region by Hans Gutknecht. The second link is to an important news story about the pros and cons of opening emergency shelters/campgrounds for the homeless — as a possible way to clean up the many encampments around the city. These are not stories directly about transportation. But Metro, as with everyone in our region, must cope with homeless issues. The agency and its law-enforcement partners have been trying to secure social services for homeless who use our buses, trains and facilities. The latest in a strain of stories arguing that the best way to help traffic congestion is to implement congestion pricing that either tolls all lanes of roads or entire geographic areas (i.e. such as downtown L.A.). This post relies on data from Portland, Oregon, to argue that those who commute during the busiest times in the morning have higher incomes than those who commute at other times — thus these folks can afford congestion pricing. As the post notes, the Oregon Legislature has asked to see a plan that would toll Portland metro area freeways. Among the many issues with congestion pricing will be equity — that those who need to travel at certain hours will be able to afford the kind of tolls it will likely take to get some motorists to change driving times or switch to transit/walking/biking. Things to read whilst transiting: just scroll through Urbanize LA and you’ll encounter a bunch of development projects to be located near transit. Seems like there’s no cooling off a very hot market. And a little music to conclude a rough Monday. I’m sure some of you reading rode the Red Line to see Tom Petty at the Hollywood Bowl last week. Here’s hoping for a full recovery for Tom, who I’ve been listening to since the 1970s. If you’re a Sproutish Source Reader, I highly recommend streaming some Petty or giving the Traveling Wilburys a listen. “It’s a long day, living in Reseda, There’s a freeway running through the yard”. RIP to the most LA of musicians. I’m so old I rode the Southwest Limited through Pasadena. LOL. I didn’t move to Pasadena until 2003. What it was like back when SW Limited was running?